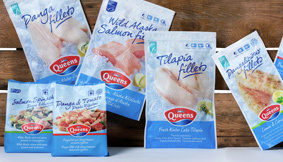 Queens Products BV is an international, inventive and flexible supplier of high quality, innovative fresh frozen food. We have a solid position at the Dutch retail market with our fresh frozen products. We achieved this by developing innovative product/market combinations within our product range, that are attuned to consumer desires. Queens Products BV is specialized in sourcing and developing new products. We have many years experience with fresh frozen products and sophisticated logistic processes. We offer our customers a fully supportive service package deal. From market information and analyses to product innovation and sales support. Queens Products has a wide range of fresh frozen products that show similarities as well as differences. The similarities are the high quality, the innovative character, the reliable producer and optimal logistics and last but not least, the added value of the flexible and broad additional service of Queens Products. Continuous innovation and carefully attuning of our products to the wishes and demands of our customers and consumers, create a large diversity within our product ranges. Our core-business is supplying fresh frozen fish and fish products from wild catch and aquaculture. Besides that, we supply a number of service products to our (inter)national customers. Within this range of service items, our fresh frozen pet food under the Smuldier brand, has grown into a successful product group.